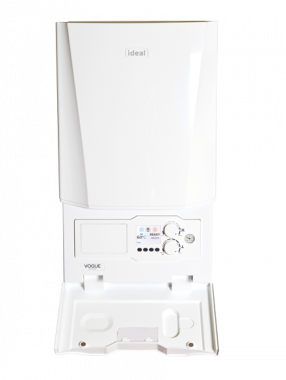 The Ideal Vogue Gen2 S15 is a condensing system boiler manufactured by Ideal. This wall mounted boiler will provide hot water for your central heating and for a storage cylinder. The key elements of the system are built into the boiler which makes it more compact and easier to service. It has been built using premium components and has multi function buttons and a backlit 3.5 LCD full colour display which make it really easy to operate. It also features an easy to read pressure gauge, uniform control opening, cool door technology, stylish aesthetics with full size door complete with damped opening, up to 7:1 modulation and a stainless steel heat exchanger. All these features result in a highly reliable boiler. This boiler has a low lift weight of 30.7kg which is up to 2.6kg lighter than previous models. The low weight and compact design make it an easy to install boiler which should save you time and money on installation. This boiler comes with 8 years warranty on parts and labour so you can be sure you have purchased a highly reliable boiler.